Moses Annenberg was Prussian-American entrepreneur who became a publishing magnate, leaving his empire to his son Walter. In a rags-to-riches life story Moses purchased and aggressively marketed a local horse-racing publication, and acquired the prestigious “Philadelphia Inquirer.” He was a ruthless businessman and achieved enormous wealth through innovative circulation gimmicks and aggressive competitive tactics. 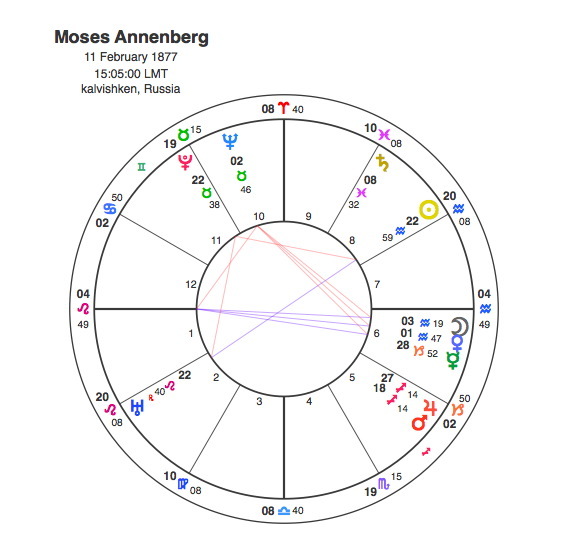 Moses Anneberg had an exceptionally strong chart with The Sun, Moon and Ascendant in fixed signs showing a tremendous determination to succeed. Both the Sun and Moon are in Aquarius and the Sun has an exact opposition with Uranus. Aquarius and its ruling planet Uranus rule modern media and communications so we can see the world of publishing that Moses focused his energy on. The opposition from the Sun to Uranus runs from the 8th house to the 2nd. The 2nd house is the house of money and possessions and is often very strong in the charts of successful business people. Leo rising would also show someone who would effortlessly present an image of being a powerful leader. The Sun in Aquarius opposite Uranus would say something about the way Moses went about his business. Aquarius and Uranus are no respecters of authority or traditional ways of doing things and the Sun opposite Uranus adds a strongly wilful independent streak. This opposition focuses its energy by T Square onto Pluto, showing the aggressive and ruthless business methods. So we have the Sun and Moon in the 11th sign, the Sun opposite the 11th sign ruler ( Uranus ) and part of a T Square to Pluto in the 11th house. All of this symbolism relates to the mass media. All the planets in the Tsquare are within 20 minutes of each other, this is one of the closest T Squares Capricorn Research has seen. Aspects that are close always make the planetary affect stronger so this tale of exceptional business success is clearly evidenced by the chart. Walter Annenberg was Moses’ only son among seven daughters and he inherited the Philadelphia Inquirer and two racing publications from his dad and by launching “TV Guide” (the nation’s only billion-dollar-a-year publication) he went on to build a vast empire encompassing newspapers, magazines, and radio and television stations selling out in 1988 to Rupert Murdoch for $3 billion. Walter’s success brought political influence and he became US ambassador to Great Britain, he was also a philanthropist, giving billions to charity. Walter Annenberg also has a very interesting chart. With the Moon and Jupiter conjunct a Leo Ascendant he would be the natural leader of an enormous enterprise. This much Leo would always give a dignified presence and strong self esteem with the ability to rule over and make the most of his inherited fortune. The Sun is in Pisces so this would give him a compassionate side explaining the philanthropy. The Sun is also in the 9th house of long distance travel and conjunct the serious Saturn. This combination points very nicely to his role as US ambassador to Britain. There are often similarities between charts of family members and astrological themes that run through families can be detected, but the connections between the Annenberg’s charts are incredible. Both have exceptionally close Sun / Pluto square aspects, Walter’s is a mere 4 minutes of arc. Both Plutos are in the 11th house. The really powerful connection is around their Moons and Ascendant. Moses has an close opposition between the Moon at 3 Aquarius and the Ascendant at 5 Leo, Walter has the conjunction of Moon at 5, Jupiter at 4 and Ascendant at 3 Leo. The Moon rules our inheritance, the things we receive from our parents, both practically and emotionally. Jupiter expands everything that it comes into contact with and any planet close to the Ascendant means that it will have a major part to play in that person’s life. Walter’s very close Moon / Jupiter / Ascendant conjunction shows his enormous inheritance and the exactness of their aspects to Moses Moon and Ascendant shows where the inheritance comes from. Moses Annenberg’s business methods did rebound on him and bring problems at the end of his life. In April 1940, Moe pleaded guilty to one count of evading taxes, he was sentenced to three years in prison and his companies were forced to pay $9.5 million in penalties. Annenberg never served out his sentence; he was released in June 1942 after suffering a brain tumor in prison and died a month later. Pluto moves very slowly and in Moses case as it is aspected to the Sun at birth it would not make another one in his lifetime. Pluto only makes one major aspect during his life, it is opposite his Moon and conjunct his Ascendant from 1940 to 1942. Bizarrely, Pluto was exactly conjunct Walter’s Moon ( inheritance ) in July 1942 when Moses died. The only Pluto / Sun transit that either of the Annenberg’s experienced was Walter’s opposition in 1968 – 9. Walter Annenberg became US ambassador to Britain in 1969, appropriately as his Sun / Saturn conjunction in Pisces in the 9th house indicated this at birth. 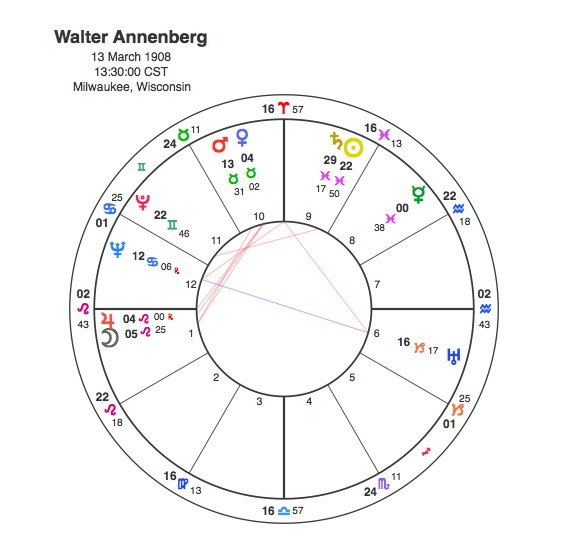 Moses Annenberg’s chart is a true rags to riches story but the astrological handover to his son Walter defies belief. Once again, Pluto’s transits triggered all the main events and ensured the Annenberg’s kept it all in the family.